Texas gubernatorial elections illustrate the fierce competition for dollars accompanying the race for the state's highest office. Though in recent years Texas Republicans often have outspent Democrats, particularly in statewide elections, Democrats have financial resources, too. Fundraising success is not unique to Republican candidates, despite their frequent partisan advantage. But, as the chart shows, money--even a massive amount from a wealthy candidate--does not simply buy victory. 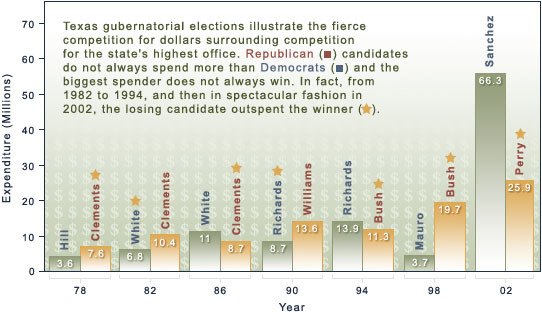 Indeed, in the gubernatorial elections of 1982, 1986, 1990, and 2002, the bigger spender lost. Nonetheless, too little money can be costly at the polls, as losses by Democrats John Hill in 1978 and Gary Mauro in 1998 show. Full Source: Expenditure Data: 1978-1998: Gubernatorial Campaign Expenditures Database, compiled by Thad Beyle and Jennifer Jensen available at http://www.unc.edu/~beyle/. 2002: http://www.ethics.state.tx.us. Election Returns: 1978-1990: A Statistical History of the American Electorate. Jerrold G. Rusk. Washington, DC: CQ Press, 2001. 1994-2002: http://www.sos.state.tx.us/elections/historical/index.shtml.